Railpictures.ca - Matt Landry Photo: CN 2949 is leading train 406, as they head through Apohaqui, New Brunswick, the morning after a snowfall hit Southern New Brunswick. With not much light left in the day, the colors of the CN locomotion really stand out from the dreary snow covered backdrop. | Railpictures.ca – Canadian Railway Photography – photographie ferroviaire Canadienne. 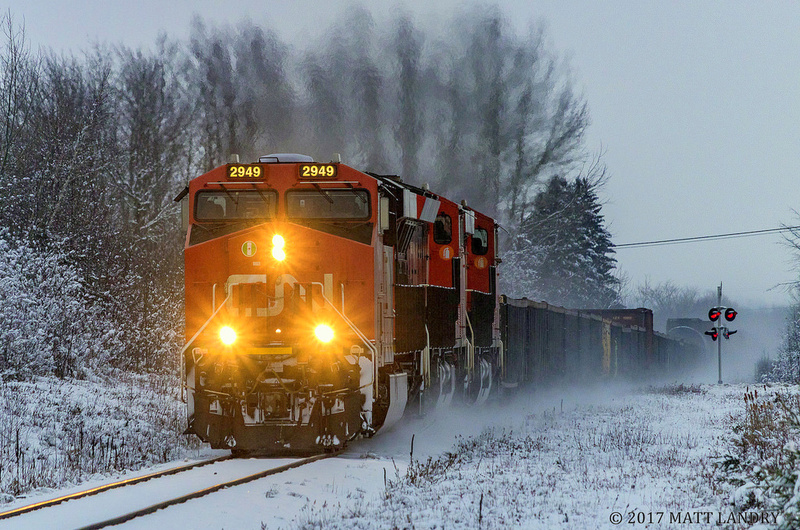 Caption: CN 2949 is leading train 406, as they head through Apohaqui, New Brunswick, the morning after a snowfall hit Southern New Brunswick. With not much light left in the day, the colors of the CN locomotion really stand out from the dreary snow covered backdrop.